The Fox Racing Titan Sport Motocross Knee/Shin Guards are an entry-level knee guard that offers complete plastic knee and shin coverage. With traditional, easy-to-use elastic fitting straps and a comfortable soft bio foam chassis, the Fox Racing Titan Sport Motocross Knee/Shin Guards will provide the protection and coverage you need at a reasonable price. Don't try this without MX boots as they will move all over. Once you put them inside the MX boots everything fit well. For the price they are worth the protection. I bought these 3 years back now when I got my first bike. They have worked really well for me, just upgrading to actual knee braces this year. I ride with a couple other guys that use this same guard and they think they work well for them too. While they do offer really good protection, a couple times when I fell the upper part got pushed to the side a bit and I still took a pretty good hit, but not having a upper strap is what makes them so comfortable. I would definitely buy them again. I have not had any trouble with the straps like some one else mentioned, but I dont leave them in my truck or out in the sun to degrade the elastic either. I don’t recommend this product. The straps are to long therefore the Velcro goes way past the sticking point. Great comfortable protection for cheap. These work well, stay in place, and fit comfortably. They aren't the most heavy duty guards in the world, but it's nice affordable protection. These are excellent knee guards. Quality and the elastic band is not to tight but just right. they fit the bill for the budget minded, will work until she upgrades to knee braces. used these last weekend in a race. They were very comfortable and barely noticed i had them on. I was skeptical because of the cheap prices compared to other knee / shin guard. I have never owned or used a pair before this. I was very pleased with the performance. I did lay the bike over once and felt they did the job they were supposed to do. very glad i had them on and i would recommend them. Not great....you get what you pay for. I bought a set of these years ago (same model) and they worked great....they were comfortable, durable, etc....the only reason I wanted a new pair was that the elastic started finally wearing out on the velcro straps. I was hoping for the same product but these have a horrible backing that sits directly on your legs. It is a solid piece whereas the old model breathed great the new model does not. It tries to slip around also....must be made in a cheap factory now. Knee & shin protection is a must, especially in the AZ desert. I've had these for over 2 years and they are holding up great. Even with the heat the elastic straps are strong. 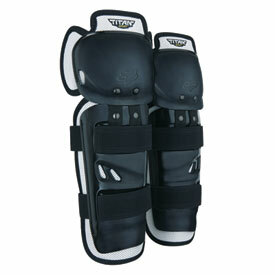 These knee guards fit great and are very comfotable to wear. Work great! stay in place. Cheap! Works under gear best but also over gear. The straps are starting to stretch out after a years worth of use. Fast shipping and fit great! This is my second set of these knee pads and they work great. I wear all fox protective items, knee, chest and elbow. Holds up well and keeps me from getting banged up. These knee pads are light, comfortable, and they stay in place. However, I do wish there was more coverage higher up the knee. I have a pair of these for myself in Adult and 3 for kids (5,8,10). I used to put them on and forget they were there but after a few years of use mine are starting to chafe badly on my knee--I'm ordering the "pro" series as a replacement. Maybe my knees are just getting fat. The kids love them. I have had two cut their pants on rocks during falls with no knee injury--they just ride off. The 10 yr old is complaining her youth pair is too short, so I'm looking for something longer for her. I think they look fine. I've used them on kids from age of 4 to 10 and would recommend them with abandon--best $20 you can spend on kid gear (well, maybe behind gloves). Less tears=more ride time. They stay in place and I forget they're there. Work under my Fox pants pretty well. I think these are by far the best shin guards you'll find at this price point. They need to reverse the hook and loop so that the hook is on the strap, because the hook on the guard catches on pant liners, but it's a minor issue when looking at the overall value of these things. They stay in place pretty nicely and are comfortable. They don't breathe super well but that's to be expected for a $20 pair of guards. They tuck perfectly into my boots and had perfect coverage. These knee pads have held up excellent to multiple crashes. They stay in place and the velcro straps seem to be very durable. I wear a knee brace sock when wearing these to keep the straps from irritating my legs, gotta get the knee brace socks! These knee pads also fit well into my boots allowing me to properly velcro my boots and not have to extend my upper straps all the way out. I bought these from a local Yamaha Shop about a year ago and have used these multiple times. They are very durable and reliable for their price. The velcro has lasted and held up very well after all the times I've used them. The only thing that fell off of mine is the little tag on each knee pad that tells you which one is for the right or left leg, but I still know which is which. Just be sure to wear some tall socks or crew socks at least because the straps that go around the back of your calves can get irritating and when you take them off, those spots can get somewhat itchy. These pads are super comfortable and cheap. They also appear to hold up to use quite well. Fits in boots very comfortable. They do exactly what you need them to. Protects your knees and shins from hits. How do these fit inside the Fox Comp 8 Boots? BEST ANSWER: Only the lowest part of the shin guard is inside the boot. Maybe a few inches. In my mind it seems like it should be awkward, but actually wearing and riding I don't notice anything--fit and function is pretty seamless. I have not used them with that model boot but I dont think it will be a issue. I have used mine without issues in a different model fox boot and also with a oneal boot. I don't have the Fox boots, I wear Alpinestars and they fit great, plus I have bigger than normal calfs. The pads do not go into the boot. They stop just above my Alpine stars. Work great and are comfortable. I have Alpinestars Tech 1 boots and i barely notice them when i ride. They fit fine inside my boots.